I wish the scanner brought out it's shininess more. 1:34 p.m. I was up kinda early...I think it was around 8-9 a.m. and I spent the morning just chatting with April and Rick about various things from mental illness histories, advances in science and research to...groceries for the day. After that, we got ready. Rob was still sleeping. We headed to Publix and stocked up on canned stuff, soups, pasta, crackers, etc. Then came home and put things away. April took the whole household's laundry over to her Mom's for the weekend. Meanwhile, Rob went up to the ATM and I scratched at a scratch art card Mom got me. I loved the gift, I was reluctant to use it because it was already outlined to show where to scratch, which kinda makes it someone else art, but I did it anyway and it came out kinda nice. After that, Rob came back and we looked through potential, female, psychiatrists for me. I have to call them back on Monday. I tried to get some stuff done on April's 'faster' computer, such as updating Blogger and my book, Part Seize. But the internet died, the computer froze and it had trouble rebooting. I didn't go through it happily, sorry, but once I came back I got through all of that. Seize is updated aside from this entry. I have some scans to make though...personal stuff. 1:42 p.m. Oh!!! 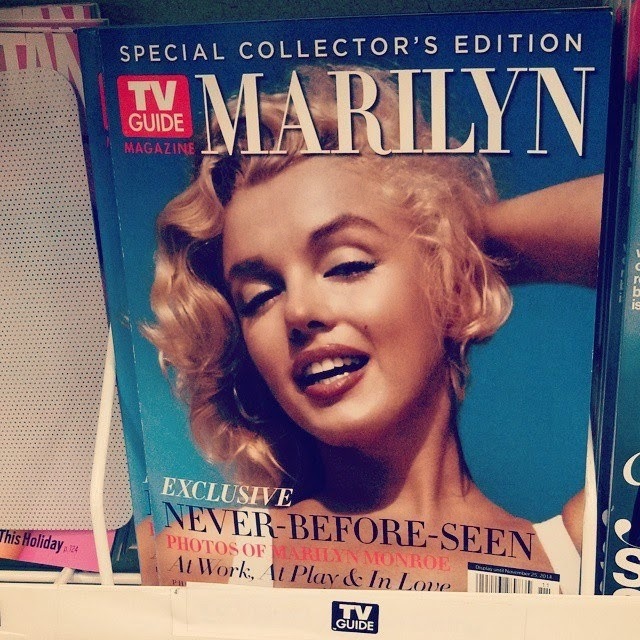 And I saw this new special edition magazine of Marilyn I wanted. :) My birthday is in a few weeks after all. 1:58 p.m. Currently scanning blood work results to go in Part Seize. 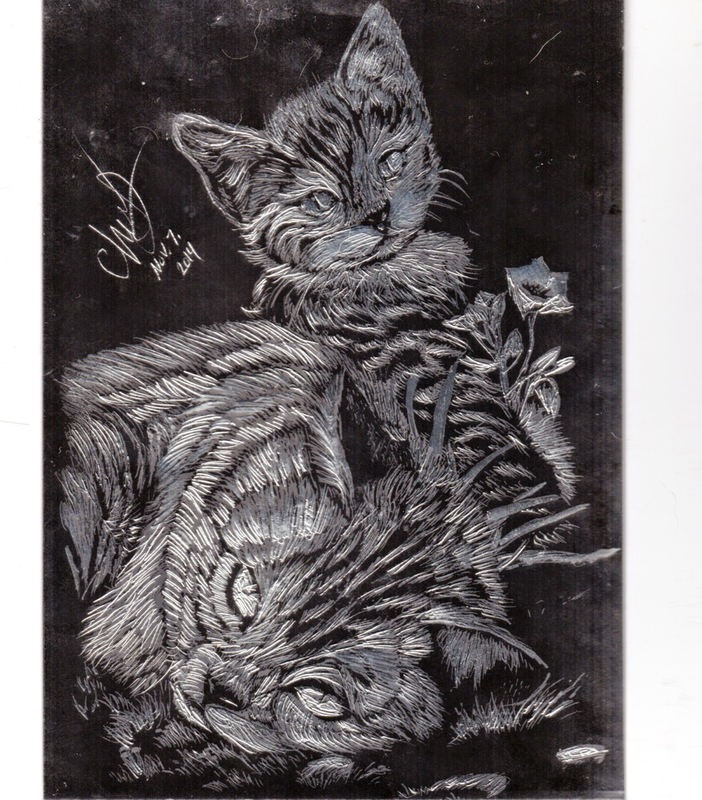 Also, scanned the kitties you see above. God Bless, Jesus Love, Live, Save~ Glory, Praise, Thanks, and all things be to God on the Highest forever and ever in Jesus Name, Amen! God is Able! 2:20 p.m. That's done with. I was googling my blood results from this previous year. Still need to update my single woman's blog...still thinking of turning that into a book. Makeup is nice, a costume even. It's probably one of my favorite photos of myself. 2:39 p.m. I've failed to mention that for the past couple months, I think, I get this random name stuck in my head : Ruth Highdecker. It's gotten to a point where I wonder if I should insert her into the Dream Doctor somehow. 4:28 p.m. Rob and I watched Jim Beaver's Ice Bucket challenge. Twas' lovely. I thought about it on the way home from the doctor's yesterday...or on the way TO it...I can't remember. But after what has probably been several year of silence, on bad terms which he may or may not have forgotten...I said hi to Caleb just now...on Facebook. "I know it's crazy that I haven't said a word in years, but I just thought I'd drop a word, say hi, and hope all is well." That may seem so small but it's actually a huge deal to me. I even have to take a deep breath now. 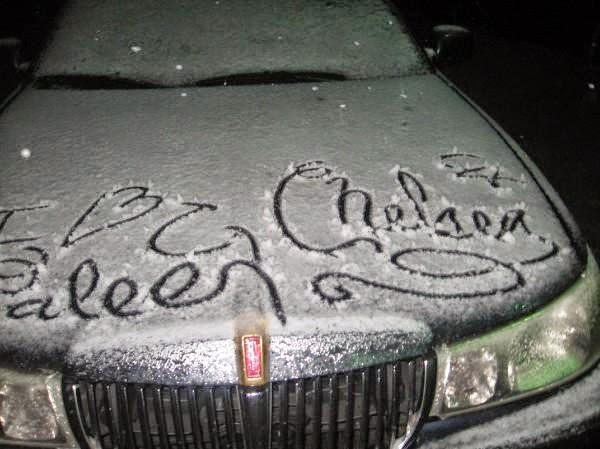 In 2006, when I was 17. he wrote my name in in the snow...and misspelled his own. then again, it was the only romantic act ever done for me. This is the only guy I ever fell in love with, who was in love with me back...for years. That's huge, whatever happened...even the worst of the worst of the worst imaginable. I've even thought that if things could be different, morally between us, because it certainly wasn't back then, I would start over with him. I don't know when the last time he was online. Like July, or August, it looks like, he just posted a Youtube video he liked. I guess God put it on my heart to do it now. I needed to come on good terms again, even if it ends, I want it to end on good terms between both of us. This is a real attempt at closure..if it is closure. 5:01 p.m. More ever, this has to be kept absolutely secret. I know April hasn't simply 'let go' of everything that happened, especially not to the level I did..I don't want to worry her. I don't want her angry at me..I'm only basing this assumption on the past. I don't want this on her mind until she can forgive him. Can pray only to God she will until then. I love April but she worries for me too much. 5:15 p.m. I have to let myself know this. It can't be wrong, or obsessive, to look back on person or a memory with fondness, just because there were some REALLY insanely bumpy parts during that time as well. I don't want to let the bad memories make me forget the best ones..and I need to work on letting the bad ones go completely. The best day will be if I never brought up the bad again. It's already over. I forgive. That's all. P.S. I've started considering these posts, and declared all the journal entries past, ever, as Letters to God. It should make these a lot better. In Jesus Name, Amen! 6:24 p.m. I put my blog out there and read others. I've just opted to take on Maranda's cats for two months, to save their lives while they move into a place for that time which doesn't allow cats. The condition is that they provide weekly litter and food for them. I haven't found out if they were indoor or outdoor cats...yet. Rob is on board after some convincing..April is asleep at her Mom's but Rob said it's a no brainer..April will do anything to save a cat's life. I just got to pray to God this whole thing goes smoothly..and that I don't get faced with a question like 'Why haven't they brought the stuff like they said they would? What's going on?' etc. "Being thankful to God for people being loving and supporting in my life. I'm not perfect, in fact very flawed. I panic when things go south, quite easily and make a lot of false judgement calls, for them all I am sorry. I don't ever want to take a single one of you, you know who you are for granted, especially when God blessed me with you..and all you do for me when there is so much already going on in your own lives. I just want you to know..you are each in my heart and prayers. And by every means, loved. In Jesus Name, Amen! God bless you all. Every one. If you've ever done me even the smallest of favors, even once, this post is about you." 6:34 p.m. Earlier today, this video made me cry a bit inside. You have no idea the level of compassion I have for death row inmates, controversial as it is. I kinda dream of some day where I get to approach them...for the humans they are...with their sins not making the difference to me. Another thing God placed on my heart. Not only that, but obviously, R.I.P. Paul Walker. 7:30 p.m. I've been looking at blogs, then a long list of Supernatural reaction GIFS. You know what I should do now? Wash out that dirty bowl I ate macaroni from over four hours ago. (I know because I have it in a previous part of this post.) You know it's bad when you're striving to stay on the internet, with nothing important to do. 7:44 p.m. I had to watch the video again, huh? Finally talked to someone polite on OkCupid. I was up for a country guy...then he kindly said he was divorced and said goodbye. Nice to know some will read the profile, quietly accepting that I won't date a divorcee. God Bless, Jesus Love, Live, Saves! Praise, Glory, and Thanks be to Him on the Highest forever and ever in Jesus Name, Amen! God is Able! 9:01 p.m. So much for that, eh? :P Kidding..a bit. I made a Facebook fan page for the Dream Doctor novel. I should get editing on Chapter Thirteen at some point but I have like NO idea what to add to the story there. I knows what's before it and MOST of what i want after it...its Sabby. I gotta give myself a break and Trust God. Thinking of sleeping in April's room tonight and listening to ocean sounds. Should have thought to leave a clean towel here since they all left with April to be washed. Oi. 10:37 p.m. I just watched British teens eat American candy...then found myself in a British accent mode. lol. Love those!